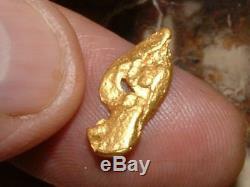 NATIVE GOLD from EASTERN AUSTRALIA. R uler is 1/4 wide (6 mm). 10 cent coin is 17 mm in diameter. N ugget weight: 2.1 G ram - 33.4 G rains. S ize: 17.2X7.9X2.9 mm. I f you've an eye for gold straight from the earth, here's a large, high-purity, character flake found on Australia's east coast. It might just as accurately be termed a'nugget' because it's very solid and shapely. My source indicated it was discovered somewhere in the vicinity of Ballarat. The brilliant yellow gold displays exceptional character, the kind one might wish to wear on a gold chain. Fortunately, this piece has not been polished to the point where it appears unnatural. Too much polishing, to me, is sacrilege. The weight is 33.4 grains (Troy). It's hard to say for certain, but judging from the color, I would guess it's well over 900 fine... Maybe as much as 950 or higher. Wait until you see the golden figurine sculpted by Mother Nature. She tends to do that a lot with natural nuggets. This one actually has a hole in it near the center. Just because gold has been going down, don't get excited. It can just as easily go back up and it has! For what it's worth, gold spot is still at historically-high levels. I guarantee the gold formation here is a natural occurrence. 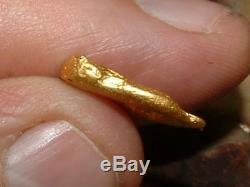 All my specimens show visible gold and are authentic gold specimens. I poured through old mining dumps for years looking at orange-yellow-rusty rock through a loupe, but I never found a piece with visible gold. Hydrothermal solutions carrying gold and silica crystallized into veins of gold quartz. This specimen comes from one of the many vein systems sourcing the immense placer deposits of the Sierra Nevada Mtns, the famed Mother Lode. 15.43 GRAINS = 1 GRAM. 31.103 GRAMS = 1 TROY OUNCE. 24 GRAINS = 1 PENNYWEIGHT (DWT). 20 DWT = 1 TROY OUNCE. 480 GRAINS = 1 TROY OUNCE. We leave no stones unturned insuring our customers get what they bargained for. If you're not satisfied with this item, contact me. 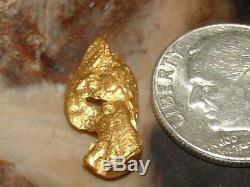 PLACER GOLD DEPOSITS & REDEPOSITS. W ith regards to placer-gold prospecting, let me share some insight based upon my 18 years experience exploring both wet and dry goldfields. I n the lower 48, if the main drainage exiting a gold source area held decent-paying ground originally, chances are good the old time miners hammered it hard, but there's still glimmers of hope. Few old placer diggings have been completely worked out. Deep, expansive a lluvial fields may cover the terrain for many miles of linear distance. 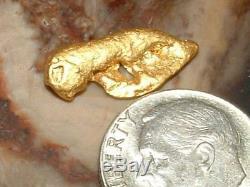 It's possible for large drainages to carry and deposit gold over the course of hundreds, perhaps thousands of miles. Conversely, the placer discovery area may be confined to a single wash measuring no more than a hundred feet long. Suffice it to say that shallower gravels were, and continue to be, far easier to prospect and mine than deep gravel deposits. These represented the easiest claims for the old timers to milk. Still, of the many relatively shallow-gravel claims I've prospected with pick-axe and shovel, it was rare not to be able to scare up a little gold somewhere. It's been proven time and again that inefficiencies cost the old timers a lot of gold. This is born out by modern day miners who successfully re-mine deposits which, by all rights, should have been depleted already. To varying degrees, new gold can also replenish creeks and the claims which have been staked upon them. During intervening years, intermittent high waters continue to erode creek and riverbanks while cutting through old tailings, abandoned diggings, and, quite possibly, virgin clip zones. Finding traces here and there isn't going to cut it for'big operators', but it might be enough to satisfy'the itch' for many small scale and recreational miners. Regarding virgin placer deposits, prevailing conditions like the depth of ancient channels, the density of alluvial packs, and the concentration of boulders often makes thorough testing impossible (by hand methods). The same can hold true for operators of heavy equipment if there are massive boulders, rugged, vertical terrain, cemented gravels, or permafrost conditions. In the case of deep channel deposits, with so much sedimentary rock layered on top of older stratified sediments, boo-coo untested bedrock material might remain on these properties. This can represent a major challenge to operators hoping to reach potential pay-streaks and pay-layers (alluvial strata) with large excavation machinery. In gold country, one can never know what values lie 5 feet inside an 80 foot deep stretch of remnant river channel the'giants' of yesteryear failed to blast away. Locating redeposited'paydirt' or a virgin pay-streak takes thorough testing and the onis is on you to make that determination. Wherever the goldfield you are prospecting, sediments need to be sampled for gold across their entire width whether it's a creek, river, dry-wash, alluvial fan, or pediment. A pan sample now and then isn't going to cut it. In some cases, it's even advisable to test the overburden. This is especially true in arid climes where desert placers may exist. If you're familiar with mountainous terrain, you know what a tall order this is, an impossible task in many cases. The linear and vertical scale encountered in expansive canyon-lands makes for tough sampling due to the sheer volume of gravels in potential deposits. Only operators loaded for bear with gigantic excavators, cats, front-end loaders, and such can open up such ground effectively. Then, it's crucial they remain diligent and conduct a proper search. The general rule is that any pay-dirt found in channels, whether they are recently deposited sediments, or of even greater antiquity (Quaternary to Tertiary age and older), will be concentrated on, in, just above bedrock, or any combination of those three pay zones. In many instances, good-paying flood gold deposits might be encountered in the uppermost strata of the most recently-deposited stream/river gravels. Anything goes in desert and pediment-type deposits. In drier climes and areas where shallow-seated lode deposits continue to shed gold, the object of your desires might be discovered very close to the surface. These represent ideal targets for MDers hunting the many dry regions of the world. Sampling and not finding anything can be disheartening, but stopping too soon during the test phase of one's operation means if a pay-streak is hidden somewhere on your claim(s), you might overlook it altogether. Now, with much higher gold prices, there are potentially valuable gold deposits in many sedimentary formations which might not formerly have been profitable to mine. When a region's geological conditions are conducive to such discoveries, auriferous channel remnants can be virtually anywhere there are sediments and often have been found miles from modern-day, flowing waterways. Don't forget, if you save ten thousand dollars by'not' purchasing a lousy claim, you've thousands to invest in a promising claim someplace else. Do you understand now how important a comprehensive testing program is? Thanks for checking out our digs. G old of E ldorado 9-1-17. 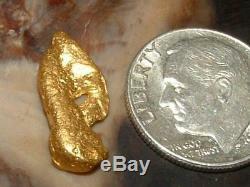 The item "AUSTRALIA NATURAL GOLD NUGGET 2.1 GRAM" is in sale since Tuesday, July 17, 2018.